All-Outdoors California Whitewater Rafting operates under the permits and approval of the U.S. Forest Service, Calaveras Big Trees State Park, Auburn State Recreation Area, Bureau of Land Management, and the U.S. Army Corp of Engineers. As a commercial outfitter, All-Outdoors offers a service through these agencies to help the public enjoy California's rivers from an intimate perspective. During our more than 50 years of California river rafting, we have developed outstanding relationships with the governing agencies listed above. We are proud of these relationships, and eager to continue working to promote education, boating safety and the protection of river canyons so that we can continue to offer a wide variety of enjoyable trips in beautiful canyons to you, our guests. Notice: Water flows on the South Fork American River result from hydroelectric facilities located upstream. Such water releases are not subject to control of El Dorado County or commercial rafting companies operating under permits from the County of El Dorado. 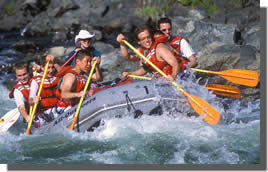 All-Outdoors California Whitewater Rafting is an "Equal Opportunity Service Provider." To put it succinctly, All-Outdoors is exemplary in its relationship to this agency and the manner in which it conducts river trips in our resource area. All-Outdoors has been a pioneer in assisting the federal, state and local agencies in developing river management plans for California rivers. All-Outdoors is an outstanding outfitter and partner to BLM. United States Forest Service, Klamath, Stanislaus, El Dorado, and Tahoe Districts. To file a complaint of discrimination: write USDA, Director, Office of Civil Rights, Room 326-W, Whitten Bldg, 1400 Independence Ave, SW, Washington D.C. 20250-9410 or call (202) 720-5964 (voice and TDD). USDA is an equal opportunity provider and employer.